The idea for Creative Home Engineering was born in 2003 when Steve Humble was working as a mechanical engineer designing surgical lasers for the medical device industry. “I was renting a large house with a bunch of my friends at the time, and we had some extra rooms that we weren’t using. I thought it would be fun to have a secret door like I had seen in the movies, but when I did a little research I was surprised to learn that there was no company anywhere that specialized in hidden passageways.” says Humble. A short time later Humble quit his job in the medical device industry and began building motorized secret passageways for people out of his parents’ garage in Arizona. Fast forward to today and Creative Home Engineering is now the world’s premier designer and manufacturer of motorized and high-security secret passageways around the world, boasting a satisfied client list that reads like a veritable who’s who of business executives, celebrities, professional athletes, government officials and even heads of state. Humble’s initial one-man operation has grown into a thriving international business with about 1,000 secret passageway systems installed in homes and businesses around the world. Steve works closely with our customers to ensure each passageway project we build is exactly what they envision. He personally oversees the final approval and delivery of every door. Travis brings a unique, multi-disciplinary skill set to the C.H.E team. He heads up design and engineering of our secret doors. With over 30 years building fine cabinetry John is an authority on quality and craftsmanship. John leads a team of carpenters to build the world's finest secret doors. Ron is the foreman for the many aspects of our shop, primarily focusing on custom secret door projects. Andrew specializes in CAD design of new custom secret passageway projects, which require complex engineering. With a number of our secret doors incorporating steel, Adam executes and oversees all welding projects. 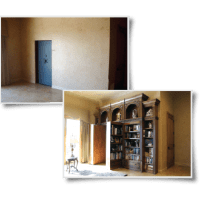 With a lifelong passion for secret doors, Jon helps the world discover that any home can have a secret door, and helps clients plan their ultimate passageway. Duncan oversees production for our pre-designed secret door manufacturing operations. Every client offers an exciting engineering challenge to be solved by our team. Below, find several studies outlining how we have created stunning passageways customized to fit each client. Or, view our custom door gallery. A Hollywood movie producer had a large living room located just off his great room. He wanted to keep a wide opening between the two rooms for a more spacious feel, while having the freedom to close off the living room for privacy and use it as a guest room when needed. He also wanted to improve the appearance of his great room by adding some contemporary cabinetry. Creative Home Engineering presented several different innovative design concepts for the client to choose rom. The result was this incredible telescoping cabinet design. 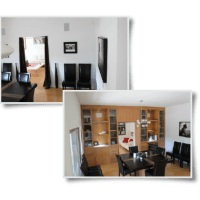 The client is thrilled and recently reported that several of his friends and family are now interested in getting similar projects for their own homes. A client had an extra bedroom located off the media room that he wanted to keep secret. At the same time, he desired to update the feel of the media room and add some attractive shelving space. Creative Home Engineering dramatically improved the ambiance of the space while simultaneously providing a private area away from prying eyes. The client is so happy with the result that he frequently shows off his secret space to his guests anyway. This client contacted Creative Home Engineering to assist in creating a secret blast-resistant bunker underneath the addition of a new wing. The secure area had to be accessible from multiple points in the main house, and each secret door had to resist forced entry attacks of all kinds; including gunfire attacks. We provided the client with multiple secret vault doors, including this beautiful motorized armored bookcase . 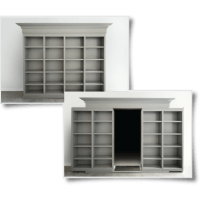 When an authorized user enters the correct code into the hidden keypad, the two halves of the bookcase silently slide apart from one another granting access to the shelter's control room. Located right off an ornate living room, this conventional vault door was an eyesore. The homeowner also expressed concern that it attracted too much attention to his private gun collection from visitors - making it an area of focus for an intruder. In response, Creative Home Engineering designed and built this gorgeous ornately carved bookcase wall unit that fit perfectly with the surrounding décor.